Planned Mods: THE BELOW IS JUST NOTES FOR POSSIBLE MODS, NOT ACTUAL PLANS. Sites for parts, besides my local Autozone and O'Reilly: a, b, c, d, e, f, g, and h.
Tires & wheels (besides ebay & Craig's List): a and b. Would consider a Boomslang harness (BF08003 for the 1996-1998 Civic) and an APEXI SAFC2 in order to produce my own version of "lean burn," but it would require converting to a wide-band O2 sensor and an EGT sensor. That would not be easily reversible for California emissions tests. Lightweight stock sized, standard belt layout crank pulley (Unorthodox Racing Part #0220610612) or a single belt conversion, possibly experimenting with Unorthodox Racing Ultra R underdrive crank pulley (part #030610502). An undampened aftermarket crank pulley seems unlikely to harm an inline 4 engine. Other size specs to double-check for any possible swap: Offset 35-45; bolt pattern 4X100; lug size 12mmX1.5; hub center bore 56.1mm minimum (larger needs spacer rings). For more info see 1, 2, and 3 (for general wheel size data across models). More weight info here. Brake drag reduction mod: drums and discs. Cleaned Catalytic Converter with citric acid. Also see this thread (DONE August 2016). Bleed brakes and inspect pistons because possible brake dragging (done 1/2017). Front main seal replace (done summer 2016). Add grounding wire (done summer 2015). Driver window whistle (fixed May 2017). 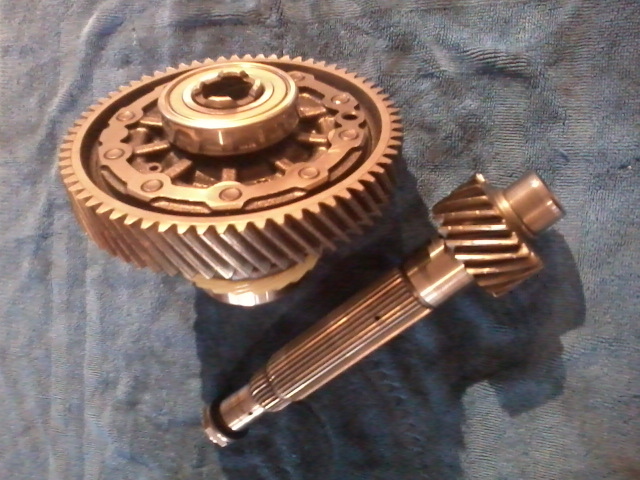 Rebuild DX trans using VX final drive gear and a rebuild kit from Synchrotech or another company. For fun: maybe a seat replacement someday. Maybe also repaint the car someday.